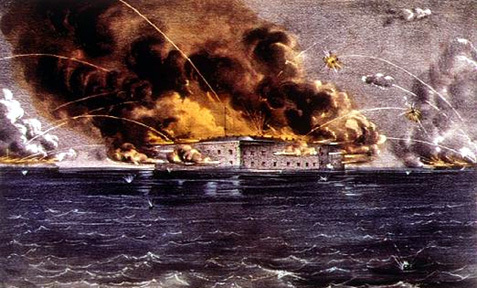 Details of what happened on that fateful day are chronicled in Morgan Reynolds’s The Firing on Fort Sumter: A Splintered Nation Goes to War, by author Nancy Colbert. Colbert writes: Major Robert Anderson was in command of the Union militia stationed at Fort Moultrie, nearby Sumter, in 1860. In the past, the army and the locals had been friendly. But Lincoln’s election caused a major rift in this relationship. Charlestonians were outraged, and Anderson knew his soldiers were not safe from their anger. They needed a sturdier fort, and Anderson looked to Sumter for protection of his troops. But he knew re-locating to Sumter would inevitably anger the locals even more. The sky became like a night of holiday fireworks. People in Charleston trooped up to the rooftops and along the waterfront to watch the show. The rumbling, deadening roar of the Confederate artillery filled the air. But Fort Sumter lay silent. No guns fired. The Confederates wondered if Anderson had decided to quite without a fight. When dawn came, though, the American flag was still flying proudly over the fort. Ulysses S. Grant: Defender of the Union by Earle Rice Jr.
Robert E. Lee: First Soldier of the Confederacy by Earle Rice Jr.